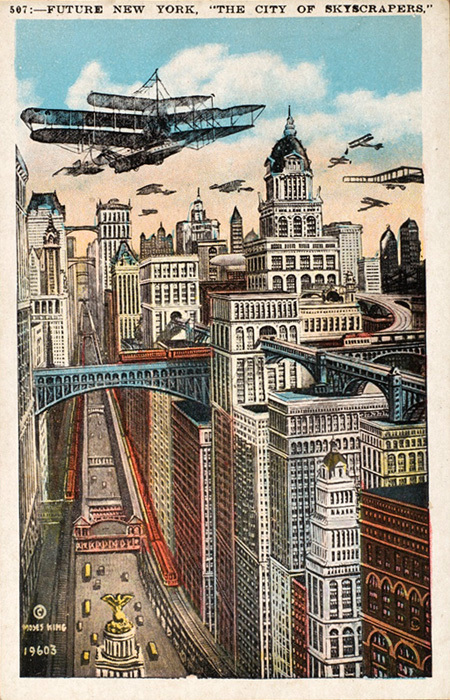 As imagined by an unknown artist (c. 1910), the future of New York is filled with low-flying bi- and tri-planes and train trestles that run through skyscrapers. The above postcard is part of the Walker Evans collection of 10,000 currently on display at the Metropolitan Museum of Art here in NYC. I recommend visiting by tri-plane as the elevated trestle is normally congested. Doesn’t this sorta remind you of GM’s Futurama from the 1939 World’s Fair?